Questioning the use of his training and wondering about the purpose of painting, Jacques Villeglé left school, and in the early 1950s decided to use ripped posters — décollage. His avant-garde spirit also rejected technical-scientific Abstractionism, as well as the automatic biomorphic configurations of Surrealism. He took an interest in Henri Matisse’s paper cut-outs (gouaches découpés), not only due to the new type of drawing thus generated, but also as reaction: where Matissed pasted, Villeglé unpasted and obtained similar results. His need to turn the street into his workshop and incorporate the daily city life coincided with the rise of a counterculture in post-war Paris. About his approach, Villeglé writes: «I see ripping as a primal gesture, a guerrilla of images and signs. In a fit of rage, a nameless passerby distorts the message and opens a new space of freedom. To me, ripped posters bring art and life closer and herald the end of transposition painting […] Being an active eyewitness of a humanity rich in contradiction is one of my ambitions. Someone in the street messes with the reflections of mainstream culture… And I follow right behind». Based on those principles, Villeglé, along with fellow artist Raymond Hains, began to use an appropriation technique from which he has never wavered. Whereas his early work focused on the typography of the lacerated poster fragments, the growing interplay of colours and shapes since the 1960s has produced pieces showing his interest in advertising and social criticism, and a certain dose of humour and sexual imagery. In 1960 he signed the Manifesto of Nouveau Réalism [New Realism], a Paris-based French movement that, like American Pop Art, appropriated consumerism products to give them new meaning through collage, recombination or juxtaposition. 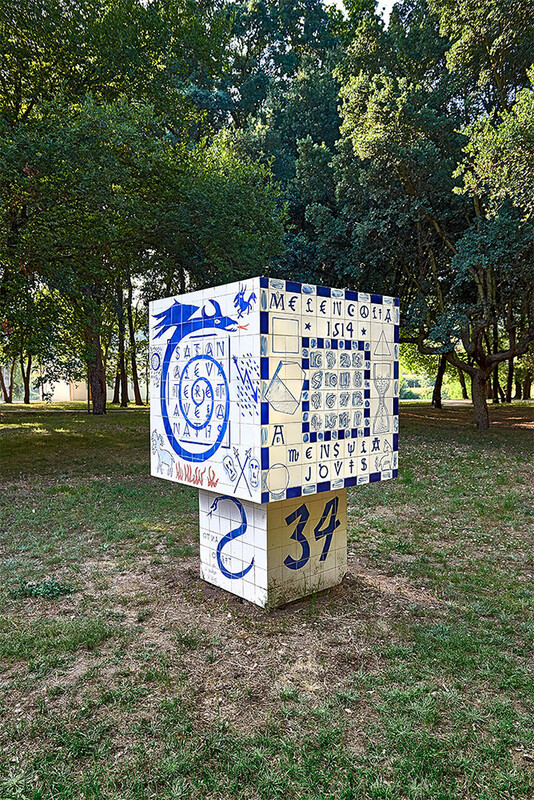 A keen observer of graphic and typographic signs, in 1969 Villeglé started to create a “socio-political alphabet”, made up of political, religious and currency symbols instead of letters , which he has turned into the subject matter of his paintings and sculptures, as in the case of Cubo [Cube], produced for the 9th Santo Tirso International Symposium of Contemporary Sculpture in 2013.